For the Canadian Roman Catholic bishop, see Gary Gordon (bishop). 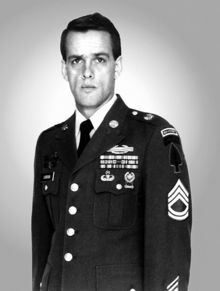 Gary Ivan Gordon (30 August 1960 – 3 October 1993) was a master sergeant in the United States Army and a recipient of the Medal of Honor. At the time of his death, he was a non-commissioned officer in the United States Army's premier special operations unit, the 1st Special Forces Operational Detachment-Delta (1SFOD-D), or "Delta Force". Together with his comrade, Sergeant First Class Randy Shughart, Gordon was posthumously awarded the Medal of Honor for actions he performed during the Battle of Mogadishu in October 1993. Lincoln Cemetery, Penobscot County, Maine, U.S.
Gary Gordon was born 30 August 1960, in Lincoln, Maine, and graduated from Mattanawcook Academy in 1978. On December 4 of that year, at age 18, he joined the U.S. Army. Trained as a combat engineer, Gordon became a Special Forces Engineer with the 2nd Battalion of the 10th Special Forces Group. In December 1986, he volunteered and was selected to join the 1st Special Forces Operational Detachment-Delta (1SFOD-D), or Delta Force. As a Delta operator, Gordon eventually advanced to Team Sergeant. Before deploying to Somalia, he married his wife Carmen and they had two children, Brittany and Ian. Gordon was deployed to Mogadishu, Somalia, with other Delta members in the summer of 1993 as part of Task Force Ranger. On 3 October 1993 Gordon was Sniper Team Leader during Operation Gothic Serpent, a joint-force assault mission to apprehend key advisers to Somali warlord Mohamed Farrah Aidid. During the assault, Super Six One, one of the Army's Black Hawk helicopters providing insertion and air support to the assault team, was shot down and crashed in the city. A Combat Search and Rescue team was dispatched to the first crash site to secure it and a short time later a second Black Hawk, Super Six Four, was shot down as well. Ranger forces on the ground were not able to assist the downed helicopter crew of the second crash site as they were already engaged in heavy combat with Aidid's militia and making their way to the first crash site. Gordon and his Delta Force sniper teammates Sergeant First Class Randall Shughart and Sergeant First Class Brad Hallings, who were providing sniper cover from the air, wanted to be dropped at the second crash site in order to protect the four critically wounded crew, despite the fact that large numbers of armed, hostile Somalis were converging on the area. Mission commanders denied Gordon's request, saying that the situation was already too dangerous for the three Delta snipers to effectively protect the Black Hawk crew from the ground. Command's position was that the snipers could be of more assistance by continuing to provide air cover. Gordon, however, concluded that there was no way the Black Hawk crew could survive on their own, and repeated his request twice until he finally received permission. Sergeant First Class Brad Hallings had assumed control of a minigun after a crew chief was injured and was not inserted with Shughart and Gordon. Once on the ground, Gordon and Shughart, armed with only their personal weapons and sidearms, fought their way to the downed Black Hawk. By this time more Somalis were arriving who were intent on either capturing or killing the American servicemen. When they reached Super Six Four, Gordon and Shughart extracted the pilot, Chief Warrant Officer Mike Durant, Bill Cleveland, Ray Frank, and Tommy Field from the aircraft, and established defensive positions around the crash site. Despite having inflicted heavy casualties on the Somalis, the two Delta snipers were outnumbered and outgunned. Their ammunition nearly depleted, Gordon and Shughart were killed by Somali gunfire. It is believed that Gordon was the first to be killed. Shughart retrieved Gordon's CAR-15 and gave it to Durant to use. Shortly after, Shughart was killed and Durant was taken alive. Immediately after the battle, the Somalis counted 25 of their own men dead with many more severely wounded. According to "America and Iraq: Policy-making, Intervention and Regional Politics" edited by David Ryan, Patrick Kiely, "his half-naked body was dragged horrifically through the streets of Mogadishu". Gordon's body was eventually recovered and is buried in Lincoln Cemetery, Penobscot County, Maine. There was some confusion in the aftermath of the action as to who had been killed first. The official citation states that it was Shughart, but Mark Bowden, author of Black Hawk Down: A Story of Modern War, a book about the October 1993 events, relates an account by Sergeant Paul Howe, another Delta operator participating in the battle. Howe said that he heard Shughart call for help on the radio and that the weapon handed to Durant was not the distinctive M14 used by Shughart. Furthermore, Howe said that Gordon would never have given his own weapon to another soldier to use while he was still able to fight. In Durant's book, In the Company of Heroes, he states that Gordon was on the left side of the Black Hawk, after both he and Shughart moved Durant to a safer location, and only heard Gordon say, "Damn, I'm hit." Afterwards Shughart came from the left side of the Black Hawk with the CAR-15. After the attack on the United States on 11 September 2001, United States Special Forces units were inserted into Afghanistan to assist the Northern Alliance forces in overthrowing the Taliban and Al-Qaeda terrorists. Following an intense mountain battle known as Operation Anaconda in March 2002, U.S. troops complex found a GPS unit and holding pouch labeled "G. Gordon". Intelligence analysts believed at first this was Sergeant Gordon's GPS unit that he purchased on the private market and used in Somalia. The Gordon family was notified immediately of the find prior to the information being released to the public. It ultimately turned out that it was not Gordon's GPS but one of a helicopter pilot lost in an earlier fight during Operation Anaconda. During his military career he earned the following military decorations: Medal of Honor, Purple Heart, Meritorious Service Medal, Army Commendation Medal, Joint Service Achievement Medals (x2), Good Conduct Medal (x4), Combat Infantryman Badge, Master Parachutist Badge, Military Freefall Parachutist Badge, Expert Marksmanship Qualification Badge, Ranger Tab, Special Forces Tab, French Army Mountaineering Badge, the Royal Danish Parachutist Badge and the Joint Meritorious Unit Award. The U.S. Navy officially named a roll-on/roll-off ship USNS Gordon in a ceremony at 10:00 a.m., Thursday, 4 July 1996, at Newport News, Virginia. Congressman John Murtha (D) of Pennsylvania, was the ceremony's principal speaker and serving as the ship's sponsor was Carmen Gordon, widow of the ship's namesake. Gordon was the second ship to undergo conversion from a commercial container vessel to a Large Medium Speed Roll On/Roll Off (LMSR) sealift ship and is operated by the U.S. Navy's Military Sealift Command, Washington, D.C. Many things have been named after Gordon. Gordon Elementary School in Linden Oaks, Harnett County, North Carolina, which opened in January 2009, was named in his honor. The school is near Fort Bragg, where Gordon was stationed before being deployed to Somalia. In the Joint Readiness Training Center, LA, The main mock city is named Shughart-Gordon. President Clinton presents the Medal of Honor to Carmen, the widow of Master Sergeant Gary I. Gordon. On 23 May 1994, both Gordon and Shughart posthumously received the Medal of Honor in recognition for the actions they took and the sacrifices they made to help protect the life of Durant and the crew of Super Six Four. They were the only soldiers participating in Operation Gothic Serpent to receive the military's highest honor, and the first Medal of Honor recipients since the Vietnam War. Their medals were presented to their wives Stephanie Shughart and Carmen Gordon by Bill Clinton in a ceremony at the White House. Master Sergeant Ivan Gordon, United States Army, distinguished himself by actions above and beyond the call of duty on 3 October 1993, while serving as Sniper Team Leader, United States Army Special Operations Command with Task Force Ranger in Mogadishu, Somalia. Master Sergeant Gordon's sniper team provided precision fires from the lead helicopter during an assault and at two helicopter crash sites, while subjected to intense automatic weapons and rocket propelled grenade fires. When Master Sergeant Gordon learned that ground forces were not immediately available to secure the second crash site, he and another sniper unhesitatingly volunteered to be inserted to protect the four critically wounded personnel, despite being well aware of the growing number of enemy personnel closing in on the site. After his third request to be inserted, Master Sergeant Gordon received permission to perform his volunteer mission. When debris and enemy ground fires at the site caused them to abort the first attempt, Master Sergeant Gordon was inserted one hundred meters south of the crash site. Equipped with only his sniper rifle and a pistol, Master Sergeant Gordon and his fellow sniper, while under intense small arms fire from the enemy, fought their way through a dense maze of shanties and shacks to reach the critically injured crew members. Master Sergeant Gordon immediately pulled the pilot and the other crew members from the aircraft, establishing a perimeter which placed him and his fellow sniper in the most vulnerable position. Master Sergeant Gordon used his long range rifle and side arm to kill an undetermined number of attackers until he depleted his ammunition. Master Sergeant Gordon then went back to the wreckage, recovering some of the crew's weapons and ammunition. Despite the fact that he was critically low on ammunition, he provided some of it to the dazed pilot and then radioed for help. Master Sergeant Gordon continued to travel the perimeter, protecting the downed crew. After his team member was fatally wounded and his own rifle ammunition exhausted, Master Sergeant Gordon returned to the wreckage, recovering a rifle with the last five rounds of ammunition and gave it to the pilot with the words, "good luck." Then, armed only with his pistol, Master Sergeant Gordon continued to fight until he was fatally wounded. His actions saved the pilot's life. Master Sergeant Gordon's extraordinary heroism and devotion to duty were in keeping with the highest standards of military service and reflect great credit upon him, his unit and the United States Army. In the 2001 film Black Hawk Down, Gordon was portrayed by Danish actor Nikolaj Coster-Waldau. Marko Kloos’ novel, Lines Of Departure (2014), centers around a space fleet containing the military freighter "Gary I Gordon" and Gordon's heroic actions in Somalia are referenced. Nikolaj Coster-Waldau as Gary Gordon in the 2001 film Black Hawk Down. 160th Special Operations Aviation Regiment (Airborne), the "Night Stalkers"
^ "Veteran Tributes". Retrieved 5 October 2014. ^ a b "REMARKS BY THE PRESIDENT AT PRESENTATION OF MEDAL OF HONOR POSTHUMOUSLY TO MASTER SERGEANT GARY GORDON AND SERGEANT FIRST CLASS RANDALL SHUGHART". White House Press Secretary. 23 May 1994. Archived from the original on 2001-07-26. Retrieved 12 February 2010. ^ "Gary Gordon". Claim to Fame: Medal of Honor recipients. Find a Grave. Retrieved 12 February 2010. ^ Congressional Record: Proceedings and Debates of the ... Congress. U.S. Government Printing Office. 1993. p. 24616. ^ Bowden, Mark (2000). Black Hawk Down: A Story of Modern War. Penguin Books. ISBN 0-14-028850-3. ^ Durant, Michael J.; Hartov, Steve (2003). In The Company of Heroes: A True Story. Putnam Publishing Group. ISBN 0-399-15060-9. ^ "Pentagon Briefing". CNN LIVE EVENT/SPECIAL. Cable News Network (CNN). 20 March 2002. Retrieved 11 February 2010. ^ Gilmore, Gerry J. "Navigation Unit Found in Afghanistan Not U.S. Hero's". American Forces Press Service. Archived from the original on 14 April 2012. Retrieved 11 February 2010. ^ "USNS Gordon (T-AKR 296) Named after Medal of Honor recipient". No. 412-96. U.S. Department of Defense, Office of the Assistant Secretary of Defense (Public Affairs), News Release. 3 July 1996. Archived from the original on 1 March 2010. Retrieved 12 February 2010. ^ Brooks, Drew (28 February 2009). "Gordon Elementary: Dedicated to 'name of a hero'". The Fayetteville Observer. Archived from the original on 30 July 2017. Retrieved 2 March 2009. ^ "Medal of Honor recipients". GORDON, GARY. United States Army Center of Military History. 3 August 2009. Retrieved 6 January 2010. ^ "Gary Ivan Gordon - Medal of Honor". Congressional Medal of Honor Foundation. ^ Kloos, Marko (2014). Lines of Departure (Frontlines). 47North. p. 328. ISBN 978-1477817407. Eversmann, Matt (2004). The Battle of Mogadishu: First Hand Accounts from the Men of Task Force Ranger. Presidio Press. ISBN 0-345-45965-2. Wikimedia Commons has media related to Gary Gordon. "Gary Gordon". Hall of Valor. Military Times. "Deputy Secretary of Defense England's Remarks at the Visions of Valor Medal of Honor Event". Archived from the original on 29 August 2010. "Gary Gordon's grave at Findagrave".